Ok, but maybe we would like to inspect this traffic more granular? Let’s assume we allowed external user for access to our FTP server. But, do we know what exactly the user is doing on our server? He gets full access through the “tunnel” thanks to enabled port. 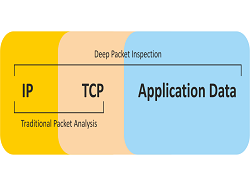 Advanced Application Inspection enables us inspection at layers 5 to 7 what means for example we may not allow for running particular commands on FTP server. Advanced Application Inpsection is MPF with Application Inspection plus inspection at layers 5 to 7. What is the difference in syntax between Application Inspection and Advanced Application Inspection ? When we type “class-map type /inspect/management/regex/” we use Advanced Application Inspection and we will be working at layers 5-7. Now let’s go over the labs. For lab simplicity all interfaces have the same security level 0 and command “same–security-traffic permit inter-interface” has been run. There is no NAT , ACLs etc. In the first lab will be using “FTP Client ” and “FTP server”. Our goal is protecting our server before deleting any files. What do we do in short? Firstly we create AAI (Advanc. Applic. Inspection) class map in which we state what we is interesting for us (match), then we specify the action (reset connection and send to the sysylog), at the end we force FTP inspection based on policy in well know class inspection_default under global_policy policy map (that exists ‘out of the box’). Now let’s see what happens, after we applied AAI, when we try to delete any file connection to the FTP server is being resetted. The 2nd lab will be interesting as well. Now we forbid the host “HTTP Client’ with IP address 192.168.0.1 access to “www.itbundle.net“, but access to the other internet sites (“www.acme.com“) will be allowed. First of all I added to the “host” file on “HTTP Client” 2 entries :”10.0.0.1 www.itbundle.net” and “10.0.0.2 www.acme.com”, because it doesn’t have access to DNS server. Now, firstly we have to create ‘regular expression‘, next in access list we mark ‘interesting traffic’ host 192.168.0.1 permitted now will be later rejected ( it is only marking!). Next move is creating AAI that states what string we will be searching in the HTTP header. Now we create ‘standard’ class map with appropriate access list match. In ‘policy map type inspect’ we descibe what we want to do with AAI class map. At the end we create new class in the global_policy polic map with inspection http. We don’t have to use service-policy to place policy-map global_policy because it is placed there already out of the box.